It seemed as though Africa was set to embrace meaningful transformation. But perhaps we were all too busy approving frameworks and strategies centred on the need for real structural transformation to realise that the African story line is still not sanguine. Huge differences in the distribution and exercise of political and economic power have resulted in violent conflicts and the key economic locomotives of this continent have been choked. By CARLOS LOPES. The fundamentals for Africa’s economic prospects are in situ. Africa continues to register the highest growth within a global slump. Our international reserves took a beating, but this should be seen in the context of internationally low-debt levels. Public deficits are still under control and there is steady increase in investments from many sources. Recent Summits with India and China, the two demographic equivalents, demonstrated trust in the future. Infra-structure projects have in the main, not been affected by the downturn, from a new Suez Canal, to the largest ever dam in Ethiopia or world size solar farms in three countries. As far as the economy is concerned the news is actually better than most. So, where are then the key factors that shift the mainstream narrative back to the past? Clearly it is a combination of two factors: fragility perception and lack of deeper structural transformation. There is a need to combine higher agricultural productivity in order to add value to natural resources and modernise services associated with urban and youth bulges. This, in essence is the content of African Agenda 2063 which was approved by the continent’s leaders. If Africa is going to sustain a different narrative it has to be based in real changes. It is therefore opportune to focus on the part of the continental narrative less strategically assessed by Africans themselves: the causes of conflicts. Between the early hours of April 11th and the late afternoon of May 14th 1994, fifty thousand Rwandese where killed with machetes by their neighbours in the Nyamata Hill. This was a very small part of what is now considered the largest genocide since World War II. Is it possible to recognise amongst those we call terrorists, be it Al Shabbab, Boko Haram or those who perpetrate the carnages in Central African Republic or South Sudan, a similar rule book? Killing without remorse? Doing it like a job, better than planting or surviving in the periphery, and then have a good drink and laugh at the panic provoked and media attention? How can this happen? How can this continue to happen? Huge differences in the distribution and exercise of political and economic power result in violent conflicts, in absence or failure of a political mechanism to address inequality. Inequality between groups rather than individuals is probably the foremost cause of conflict in Africa. It exists on three mutually reinforcing levels: economic, social and political. Relatively deprived groups seek or are persuaded by their leaders to seek redress. Privileged groups may also be motivated to fight to protect privileges. Horizontal inequalities are most likely to lead to conflict where they are substantial, consistent, and increasing over time. Exclusion, the extreme manifestation of inequality, is a major factor igniting conflicts. Of particular attention is the exclusion of youth. Uneducated and unemployed youth is a common characteristic to countries experienced conflicts. This marginalised and excluded fraction of the population has been more prominent in the conflict as combatants and least visible during peace. Very often the richest regions in minerals, oil and gas and which contribute most of national revenue are the poorest in terms of social development and general wellbeing. The collapse of State institutions translated by its inability and ineffectiveness to provide basic services or security has proven to be an important trigger to conflicts. Social stability is based on a hypothetical social contract between citizens and government. People accept state authority so long as the state delivers services and provides reasonable economic conditions. With economic stagnation, decline, or worsening state services, the social contract breaks down, and violence is likely to occur. The collapse of infrastructure completes the erosion of state authority. The combination of a breakdown of institutions and physical infrastructure coupled with the use of ethnic violence creates the conditions in which violence becomes self-sustaining. Evidence suggests a higher incidence of conflict among countries with low per capita incomes, life expectancy, and meagre economic opportunities. Of the 54 African states only 8 have not experienced armed or violent conflict since independence. War confers benefits on individuals as well as costs which can motivate people to fight. Young uneducated men, in particular, may gain employment as soldiers. War also generates opportunities to loot, profiteer from shortages and from aid, trade arms, and carry out illicit production and trade in oil, drugs, diamonds, timber, and other commodities. Where alternative opportunities are few, because of low incomes and poor employment, and the possibilities of enrichment by war are considerable, the incidence and duration of wars are likely to be greater. This “greed hypothesis” has its base in rational choice economics. Very often, political leaders deliberately “rework historical memories” to engender or strengthen cultural identities in the competition for power and resources and justify the recourse to violence because of economic interest. Environmental stress can be a serious catalyst for violence too, especially when people seek alternatives to desperate situations, while resource riches give strong motivation to particular groups to gain control over such resources. This reality is maximised by illegal trade and financial transactions that are depriving the continent of over fifty to sixty billion USD every year. Results show that the economic performance of conflict areas is on average 10% below that of conflict-free areas in most GDP performance categories. A study estimated a loss of 284 billion USD (in constant 2000 rates) for 23 African countries, from 1990 to 2005. This figure represented then an average annual loss of 15% of their GDP. Regression analysis indicates a loss of about 2.2% GDP growth due to conflict. The interrelated nature of African economies also means that the costs of war within a sub-region generally result in economic costs for neighbouring countries. These include production losses through loss of opportunities deriving from migration, trade losses, increased costs of security and policing and the costs of supporting refugees. In Niger’s real GDP growth reduced to 3.6% in 2013 after expanding by 11.1% in 2012. In Mali, the series of events triggered by the 2012 outbreak of conflict and insecurity led to falls in government resources and expenditures by at least 30%. In DRC internal investment as a percentage of GDP dropped from 31.6% in 1997 to 17.7% in 1998; and reached its lowest level of 2% in 2000. Libya oil output has shrunk to less than 400,000 barrels per day (bpd), from about 1.7 million bpd before the outbreak of conflict. As a result, GDP contracted by an estimated 24% in 2014. The government accounts are expected to post a deficit of about 80 % of GDP in 2015, with the current account deficit exceeding 60% of GDP. The message is clear. African priorities either deal upfront with the causes of conflict, or everybody will pay the price for the fragility perception. It is true that countries in Europe, Asia or the Americas were stabilised after prolonged wars that were fomented by the same ingredients of exclusion. They evolved to create better institutions, regulated markets and stabilised security. But it is also true that when it happened there, there was no universal telephony coverage or global media. A continent with more conflicts and affected people than Africa right now, continues to be associated with progress and change. I am talking about Asia. If Africa wants to follow suit there is a need for boldness, a common security framework and squarely accept the challenges of exclusion and managing diversity. That is the only way on deals with die hard perceptions. Rule number one -to kill- with no rule number two, is still mobilising far too many in the continent. We need Africa to focus on the “why”, and not allow this pervasive virus mentality to ignore the achievements of the past 15 years. The “why” in fact can take inspiration from a virus’s metaphor. Any virus is basically a micro infectious agent that replicates only inside the living cells of other organisms. Viruses can infect all types of life forms. Even if they are not inside an infected cell or in the process of infecting a cell, viruses exist in the form of independent particles. Virus spread in many different ways, but they do have a pattern. It is known that virus can come from far away. The good news is that viral infections in humans provoke an immune response that usually eliminates the infecting virus. Immune responses can also be produced by vaccines, which confer an artificially acquired immunity to the specific viral infection. Reference to Jean Hatzfeld, Une saison de machettes, Seuil, 2003. Dr. Carlos Lopes is the Executive Secretary of the Economic Commission for Africa, headquartered in Addis Ababa, Ethiopia. 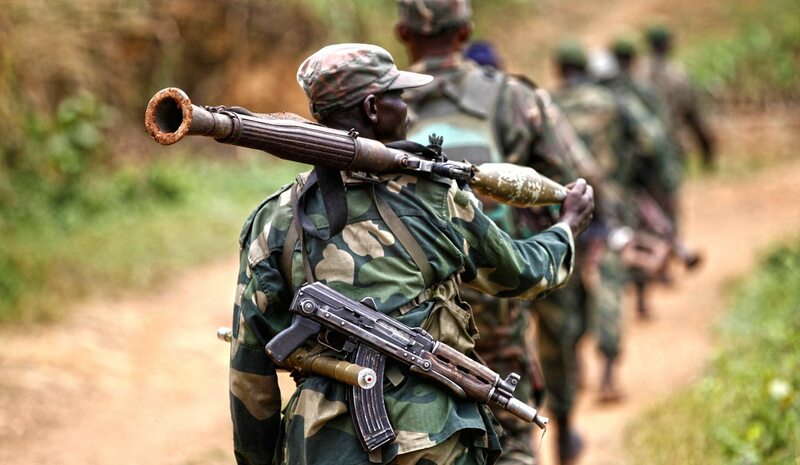 Photo: Democratic Republic of Congo military personnel (FARDC) patrol against the Allied Democratic Forces (ADF) and the National Army for the Liberation of Uganda (NALU) rebels near Beni in North-Kivu province, December 31, 2013. REUTERS/Kenny Katombe.